International Journal of Research in Health Sciences,2014,2,4,1014-1020. 1-Associate Professor in Microbiology, K.I.M.S Karad. 2-Paediatrician. M.B.B.S. D.C.H., Maharashtra, INDIA. Background: Transfusion Transmittable Infections (TTIs) continue to be a major threat to safe blood transfusion practice. The WHO recommends universal and quality controlled screening of blood donors for major TTIs. Aim: We conducted a 10 years retrospective cross-sectional study to determine the seroprevalence of TTIs among the blood donors at Tertiary care Hospital. Also we analyzed the changing trend and co-infection rate of TTIs. Material and methods: A total of 38,237 blood units tested for TTIs, viz., anti HIV 1 and 2 antibodies, HBSAg, anti HCV antibody using ELISA. Test for syphilis was done by rapid plasma regain test and peripheral smear examination to detect malaria parasite. Malascan rapid test was introduced for malaria since January 2013. Result: In present study highest seroprevalence observed was for HBSAg 1.45% followed by HIV 0.39%, HCV 0.1% and syphilis 0.01%. Seroprevalence for hepatitis C was increased from 0.11% in 2011to 0.14% in 2013. During study period decreasing trend for seropositivity of TTIs was seen. In 9 donors we found co-infection of TTI markers. 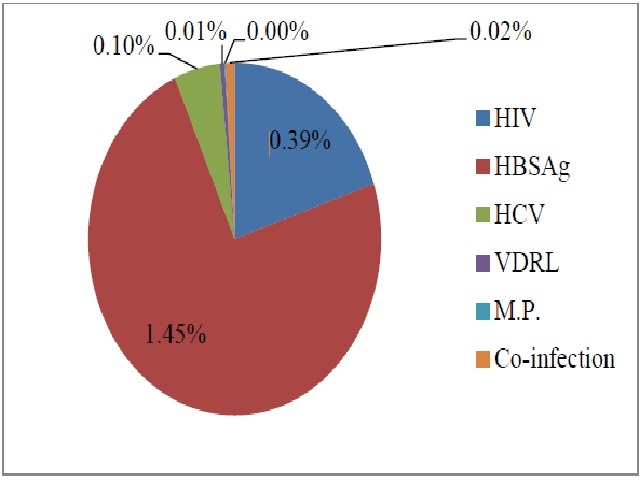 Eight HCV positive donors were also showed positivity for a second TTI (5 for HIV and 3 for HBSAg). Conclusion: In present study Hepatitis B infection was most prevalent among TTI. Also HCV infection poses a threat to society due to its increasing trend. There is definite need to encourage voluntary donors, ongoing newer modes of screening test like enhance chemiluminisence and NAT testing which will improve blood safety further.